The HS-1B - tis the season to be surprised. Discussion in 'QRP Corner' started by KL7KN, Dec 24, 2017. 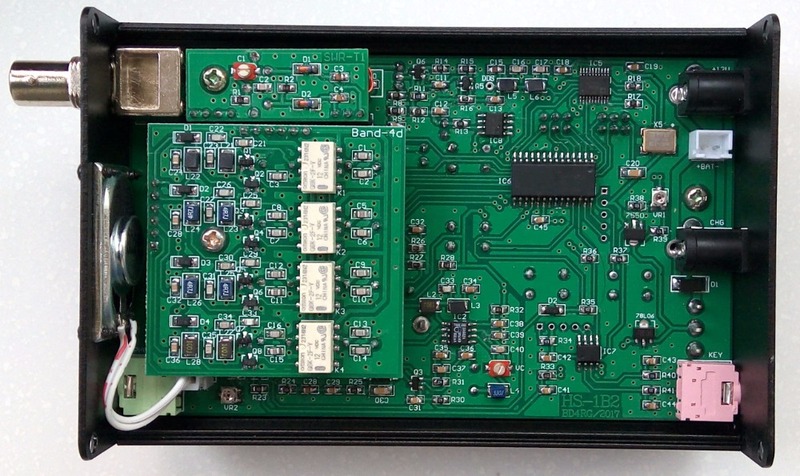 HS-1B small CW QRP transceiver 7MHz 10MHz 14MHz 21MHz. I don't know if this a repeat of the Pirating of the HB-1B by the Chinese seller RadioPhantom a few years back. Ironic, eh? 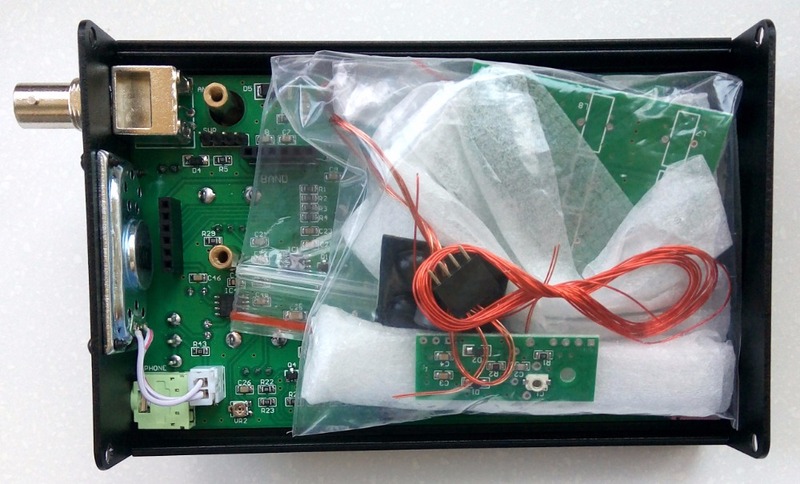 "To further complicate things, the HB-1B MK II was sold on line (from China via E-bay.com and Ebay.ca) by a vendor going by RadioPhantom..
""Please be cautious that a ebay seller who is not a authorized vendor of YouKits is again selling and advertising the HB1B MKII as a YouKits radio. These are counterfeit units. ... All these counterfeit units showing "Youkits 2013" when power up because they copied our older version. " The above was the warming issued by You Kits - I'd really like to hear if you have one of these - low power out seems to be the real tell, in addition to the 2013 display date. Please note that radiophantom is again selling the fake HB1B’s but has moved his stuff and description to ebay.ca from ebay.com to get around the hurdle. Yimin who is : yanjiewang7678 is the real YouKits dealer on ebay selling the HB1B MKII. Please do not deal with radiophantom. The product is four band machines (7MHz, 10MHz, 14MHz, 21MHz). HS-1B small CW QRP transceiver is small in size, light in weight and can be built in batteries, especially for travel and field activities. Covering 40 meters, 30 meters, 20 meters, and 15 meters, four amateur bands. In the interior, the battery space is reserved and the built-in battery socket is built, which can be placed in three sections and 18650 lithium batteries. A special battery charging socket CHG is set up. LCD display can display: working frequency, working mode, power supply voltage, receiving micro modulation (RIT) transmission micro modulation (XIT), standing wave and so on. 20 memory memory frequency points, which can easily change the working frequency. Frequency step: 100Hz, 1KHz, 100KHz. Light-emitting diodes are installed on the panel to monitor the launching status of the machine. The small horn is built in the box, and the horn can be directly driven. Looking at the video - it is clear the display/software is that of the HS-1A/MFJ-9200 - in fact, the early MFJ-9200 radio splash screens showed HS-1A on start. There is no indication of needing band modules - something the HS-1A and MFJ-9200 both needed - and while the seller says the unit will display SWR - I see no place on the truncated 2 line display that would display. The seller claims space/set up for an internal battery. It does show a charge port - on the left side, clearly different from the HB-1B - and the 9200 doesn't have an internal battery - but does have the connector to do via operator mod. So, if this is a pirated rig, the seller is pretty sloppy in the ad. I will continue to chase this - what a fun surprise for the season! That seller is in Portugal, pt is an internet country code. Lets get an English translation. Look toward the top far top right, you'll see "Go to Global Site (English)" click that and type in 'HS-1B"
This is a four-band machine (7MHz, 10MHz, 14MHz, 21MHz), the package machine motherboard has been installed and debugged, as long as their welding around the magnetic ring to install the filter board and standing wave detection board can be. ● HS-1B small CW QRP transceiver small size, light weight, can be built-in battery, especially for travel, field activities. ● cover 40 meters, 30 meters, 20 meters, 15 meters four amateur band. ● Built-in battery space and built-in battery socket, you can place three 18650 lithium battery. ● A dedicated battery charging socket CHG is set up. ● LCD display can display: operating frequency, operating mode, power supply voltage, receive fine-tuning (RIT) emission fine-tuning (XIT), standing wave and other information. ● 20 memory frequency memory, can easily change the operating frequency. Frequency step: 100Hz, 1KHz, 100KHz. ● The panel is equipped with a light-emitting diode to monitor the launch of the machine. ● Built-in small speakers in the chassis, you can also directly drive the external speakers. Package Size: 10cm x 10cm x 10cm (3.94in x 3.94in x 3.94in)"
If you go just past that description, you'll see that he only made two sales in the last six months to someone in PL = Poland. Thank you. It also shows more detailed photos of the unit. It still appears to be a Chinese made 'kit' - one not currently marketed in the West. The 15 page blog you refer to - HELLOCQ - also talks of the HS-1A. The completed radio is still listed on ebay - but this looks to be another 'garage' seller with just 3 rigs listed as available. The labeling for this, the HS-1B2, is in English. The second is that this is a rig that is machine assembled. seems to have an RF gain vs the horrible on/off ATT of the 9200. The Hello-cq chat seems to indicate the rig can be had with just one band or up to four. I would be speculating to call this a "Product-improved' version of the HS-1A/MFJ-9200 - and with the improvements noted, these changes will have answered the majority of 'shortfalls' of the -9200 expressed to me by current owners of the rig. the speaker is a bit of an odd duck, as most operators I know use cans/earbuds for CW work. If listening to SW broadcasts, then it could be a plus, tho the size would indicate less than hi-fi sound. The 4 band filter is a two edged sword, as it introduces relays into a radio that had none to date. Each operator may decide on that one, I am enthusiastic about the -9200 owing to no relays as they are, IMO. a failure point. Still, over all - even with the growth of the in size and weight, it still looks like a great portable setup. To jump into wild speculation, since the HS-1A became the MFJ-9200, will this rig become the replacement for the -9200? I might be alone on this, but I certainly hope so. It has internal battery /w charger port, is multi-band so no need to open the back to swap out band modules and so on. It would also appear to be a direct competitor to the HB-1B sold by You Kits, so I doubt it would be carried by them, esp as the price point looks to be lower. The HB-1B and the HS-1A/MFJ-9200 share a lot of common DNA - owing to being designed by the same person BD4RG, BU XIANZHI. In fact, the earliest models of the 9200 would display "HS1A" on power up. I guess I'll have to wait and see what the New Year brings. Still, kind of fun to see all the new rigs not offered in N/A.